Rattan is one of the materials for furniture making that is also much use instead of wood. As well as wood, rattan is material from trees that can be renewable. Rattan is a product of tree species that live in the forests. In the forest rattan vines grow following the tall and big trees. Therefore rattan plantation is more difficult than wood plantation because it requires a high tree to place it. Last time when there is lot of tropical forests available, the rattan is easily obtained and the price is cheap, since it just a by product from the forest. That time when rattan was lot available, there are many furniture made of rattan in many models and design. 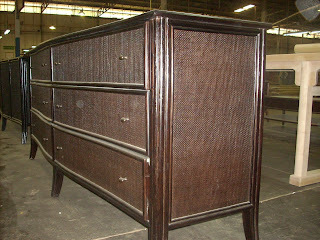 There was many furniture factories use rattan as the main raw materials. Now when the tropical forest is reduced the rattan became more difficult to be obtained and the price became more expensive, then less furniture factories that use rattan. The advantage of rattan is that he is unique, elastic and very flexible. Rattan stick is very easy to be bended, to make unique shape in many form. Rattan can also be cut, sliced in any size and woven with many form and model. Rattan as furniture substrate is considered strong enough, even many are also used for outdoor furniture. Since now rattan becomes increasingly difficult to get and the price became more expensive, the furniture made from rattan becomes less, now rattan is more use with combination with wood as the accent on wood or metal furniture. Rattan sliced and woven to create a form on the drawer front, seat back, side or top wall with a frame from wood or iron. Now there is also developed a rattan synthetics in many model to replace natural rattan. 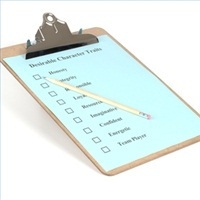 Compared with wood, rattan has less variation in type. The rattan mostly has same color base and form without any grain and pores. The rattan variation should be made in the processing. Process production to make rattan furniture is also relatively simple compared with the wood. Sanding the rattan can be done with a simpler process because the surface area is relatively small. The sanding mark that could be big problem for wood is not a problem for rattan furniture. Such as wood, rattan should also has to be dry before the finishing process is started. There are 2 types of rattan, the outer rattan and the inside rattan. The outer rattan is a part of peeled rattan skin, while the skin is a rattan cane which is the outer shell. The skin rattan is the most expensive part because it is very strong, flexible and has bright looked. It will make a bright looked and nice looked with a right finishing. Rattan part is usually taken out of small slashed to woven in a variety of model and style. Rattan wicker can also be used for the back of a chair or a seat on the couch to replace the other materials. 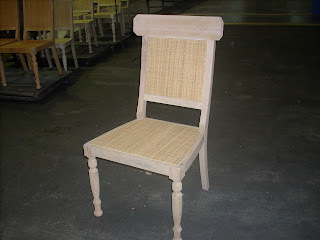 Rattan is also available in post form that can easily bended and form to make furniture. The finishing for rattan is similar with wood finishing. The material for wood finishing usually can be used to finish the rattan. But the rattan finishing should according to the rattan furniture model.The rattan dose not have grain and pores as the wood, so the rattan finish should enhanced its form and model. The wash finish finish that will enhance its form and pattern is good choice for the rattan product. The nice result is also can be resulted with antique finish, with the application of glaze. For outdoor uses, the rattan with natural finish are also good choice. There are 2 things that must be considered in finishing for rattan, the rattan inside and outside. The inside part of rattan is a material with high porosity, since that it will absorb lot of finishing materials in the finishing materials. To produce a smooth surface he needs lot of sealer or top coat. This material will also absorb more stain, so the stain application must be done carefully. To prevent the dark and dirty spot of the stain usually rattan is sealed and sanded before stain application. The opposite is the skin rattan; he i very dense and absorbs very little finishing materials. This will create a bright and clear finishing looked, but the finishing material is hard to stick to its surface. 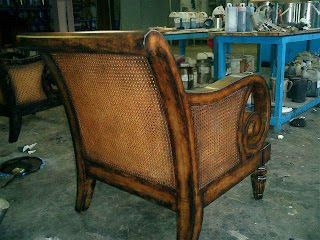 This some times create adhesion problem for the finishing, therefore, the skin of the rattan finishing usually used a special sealer and lacquer to strengthen the adhesion.